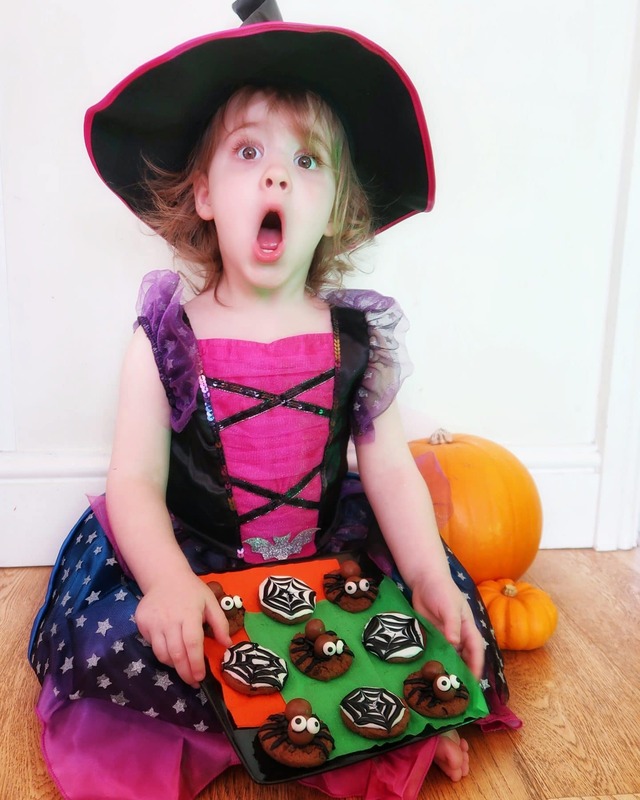 Halloween is fast approaching and if you are planning on hosting a party, or would like to give out something a little different to those adorable trick-or-treaters, then look no further. These spooky Halloween cookies look really effective but they are incredibly easy to make and take very little time. They are perfect for when you want to wow but are a little behind on the prep. 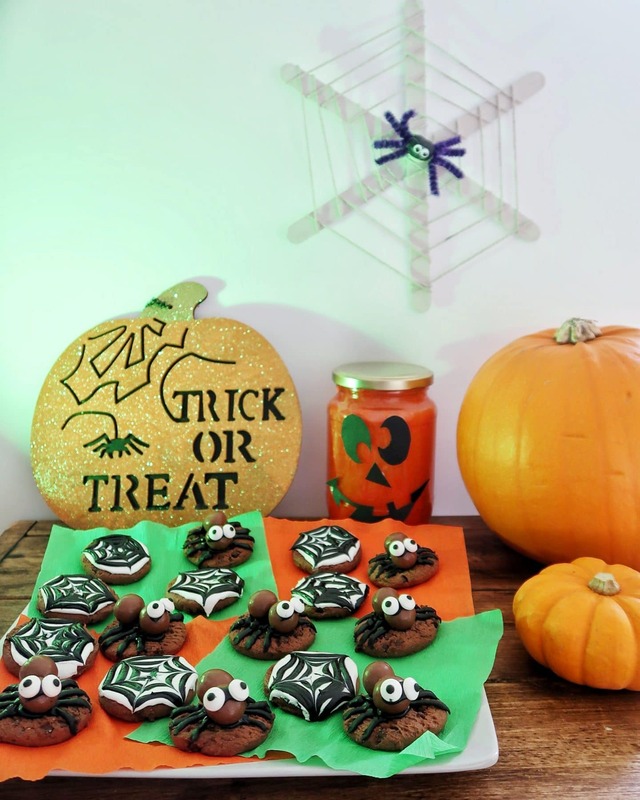 Maryland Cookies asked me to come up with some Halloween treats using one of their products and I have created these spider and spiderweb using Maryland Double Choc Cookies. 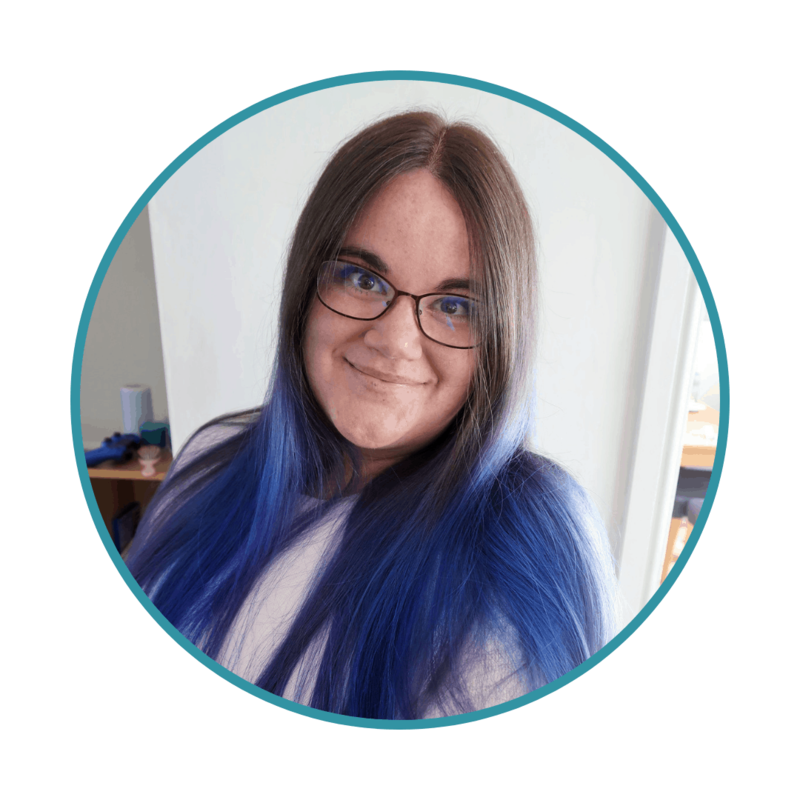 They are so easy that you can get the kids involved for a pre-Halloween activity too. Candy eyes or small sweets to make eyes. 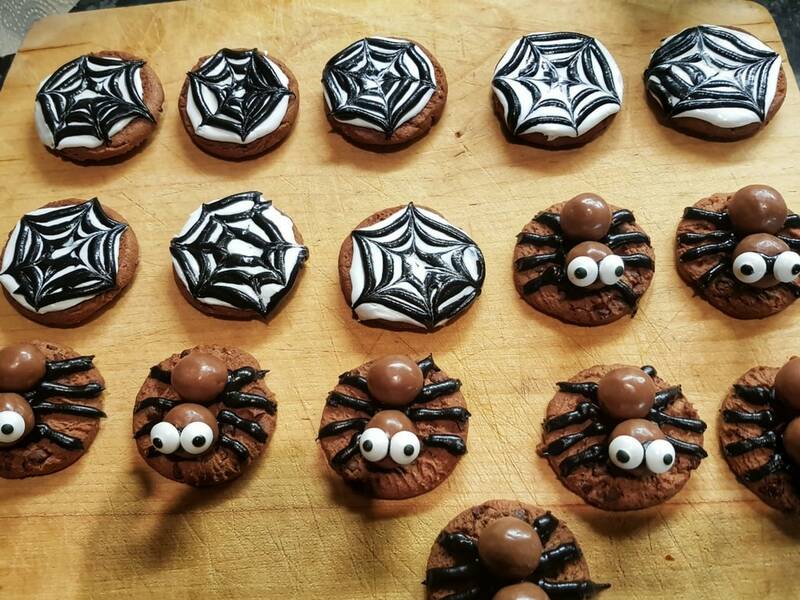 The easiest way to make these spider cookies really quickly is to set up a little production line. 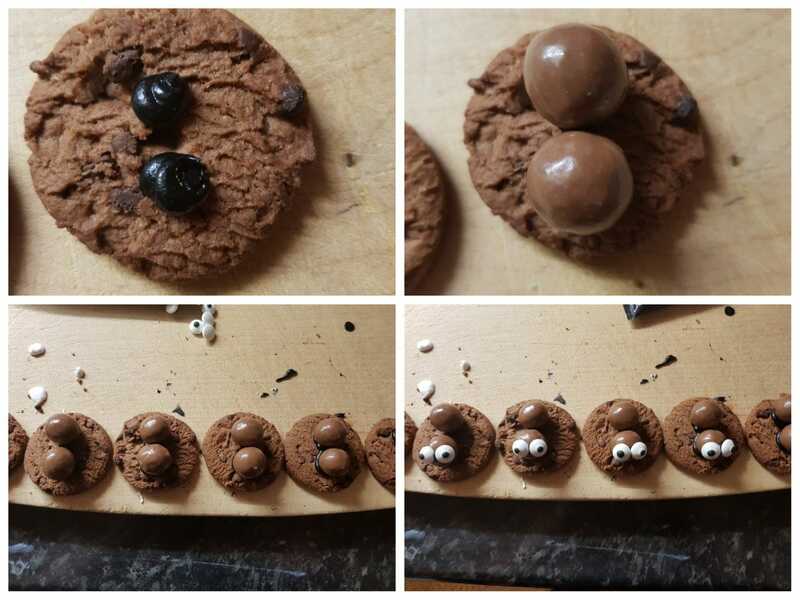 Firstly, set out your cookies in lines and make sure you have enough chocolate sweets and eyes to make your spiders. Next, Pipe some icing spots on the top of your cookies to act and cement for the chocolates and then stick them onto the biscuits. Next, add some piped icing on the top of one of the chocolates to stick the eyes into place. 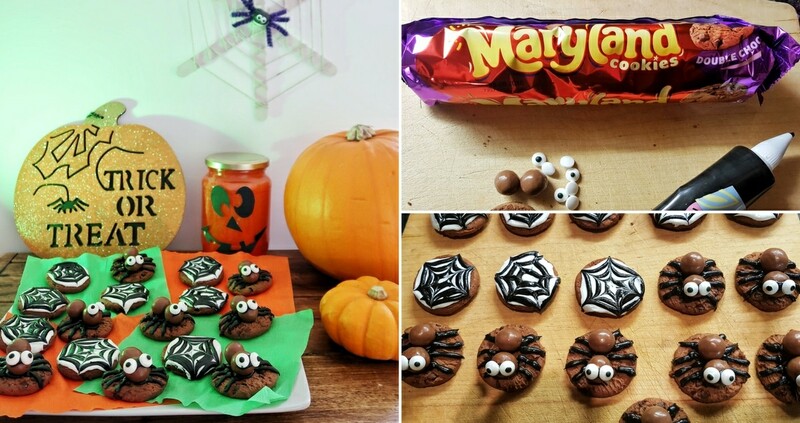 Finally, you can pipe black icing ‘legs’ to complete your spiders. You can then just leave them in the fridge for an hour or two to make sure the icing sets. 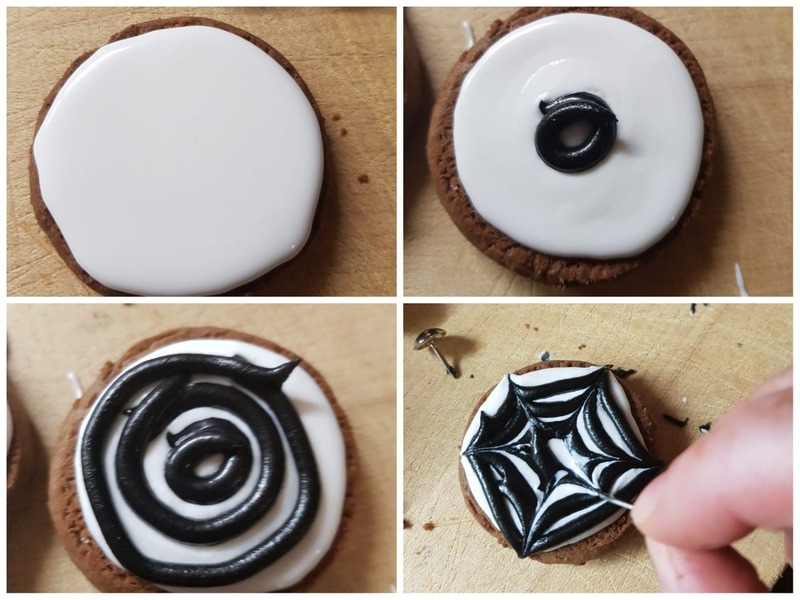 To make the webs, it is best if you use the underside of the Maryland Double Choc cookies, as they are flat and take the icing and pattern better. Next, drizzle white royal icing so that it covers the flat side of the cookie. This is really simple to make and you can find an egg-free recipe here. However, you can get really convenient ready-made squeezy bottles in the shops these days! You may need to leave the icing to set a little (but it should not be solid) before moving on to making the webs. To do this, pipe black icing in concentric circles, starting in the middle of the cookies. You can fit about 3 circles on a Maryland cookie. For the last step you will need something like a toothpick or fine needle. Starting in the middle, drag your sharp point out from the middle of the cookie to the edge. Repeat this step several times, spreading out your lines to create the web. I have used black and white icing but you could easily use other colours if you wanted. These cookies should then also be left in the fridge for a few hours in order to set the web shape. And there you have it – spooky Halloween cookies that take no time at all. They make a great addition to a Halloween spread or something special to give out to trick-or-treaters. 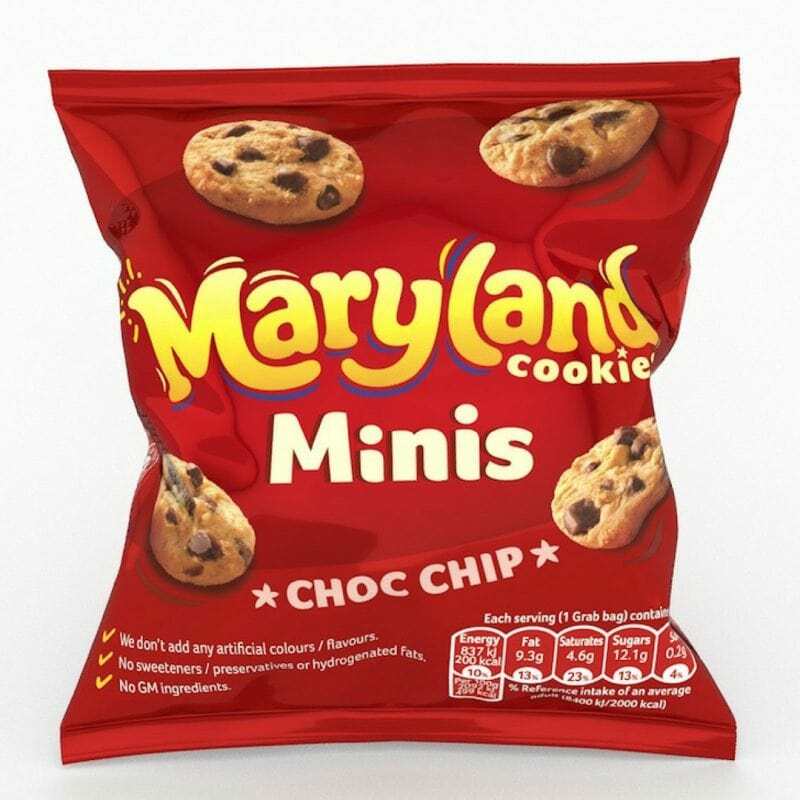 If you want something else that is really easy and convenient to give out to trick-or-treaters, Maryland Minis make great alternative to other sweets and chocolates. Please note, this is a paid collaboration with Maryland Cookies. I love these, easy enough for my boys to to themselves.